The 9mm and .380 both have the same diameter bullet, but the 9mm casing and overall length is longer. The .380 has less recoil so is popular with concealable handguns while the 9mm is more powerful and has more recoil. Both can be great defensive calibers if ammo is properly chosen. 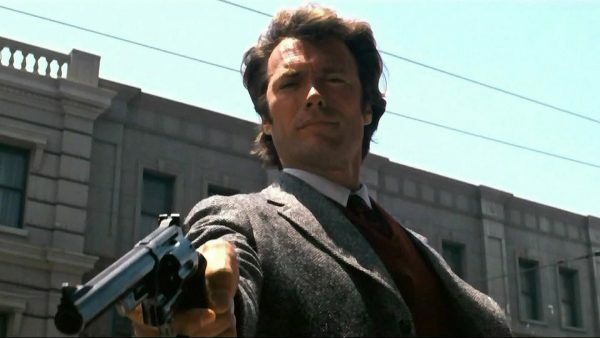 Some people love the 9mm, while others prefer something a bit bigger like the .45 ACP – or if your name’s Dirty Harry, you probably never leave home without your trusty .44 magnum. The .380 doesn’t get as much recognition as some of the other big name handgun calibers, mostly because it doesn’t have that hard-hitting reputation that the 9mm, 10mm, and .45 ACPs. The .380 is an American-made cartridge that was created in 1908 by John Browning. It’s also referred to as the 9mm Browning, the 9x17mm, and the 9mm short, all due to the fact that it has the same diameter as the 9X19mm Parabellum that we all know and love. But in order to avoid confusion, I will not be referring to the .380 by any other name in this post. The .380 was designed to be a low-recoil round that was easy to manage but strong enough to neutralize oncoming threats. Unfortunately, the .380 never lived up to its true potential as a service pistol and was overshadowed by the performance of the 9mm. Still, it did see some action among police forces, and was the caliber used by the MAC-11 submachine gun. 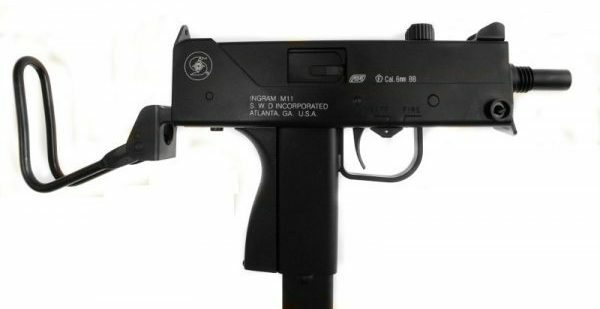 The MAC-11 may be ugly but it’ll run through an entire 32-round mag in less than two seconds. Even though the .380 never lived up to the expectations that John Browning may have hoped for, it did become a popular backup pistol due to its relatively small size. And thanks to the gun’s low recoil, it has been marketed as a great self-defense cartridge for inexperienced shooters. With the exception of the train-stopping .45 ACP, which has a long history of success in the field, most other cartridges in production are going to have a hard time squaring off with the 9mm – and for good reason. The 9mm gives you the best of all worlds: magazine capacity, control, and power. It’s not hard to see why it’s not only the favored service pistol around the world, but also one of the most popular calibers time and time again. 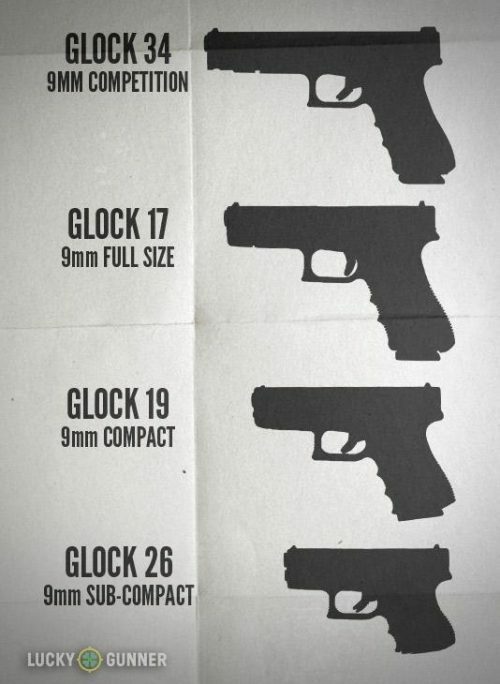 Various 9mm Glocks of difference sizes, courtesy of Lucky Gunner. When we’re looking at power, the 9mm unanimously beats the .380 every time. It’s a heavier cartridge that produces significantly more energy (including recoil energy) than the .380 ACP. If power is your primary focus and you’re thinking of going with a .380, you’re barking up the wrong tree. It’s been (unfairly) stereotyped as an underpowered cartridge for almost as long as it’s been around, and ballistic tests place the 9mm lightyears beyond the .380 with regards to power. And while it’s no match for the 9mm, shooting the right ammo can turn transform your .380 into a formidable concealed-carry pistol. 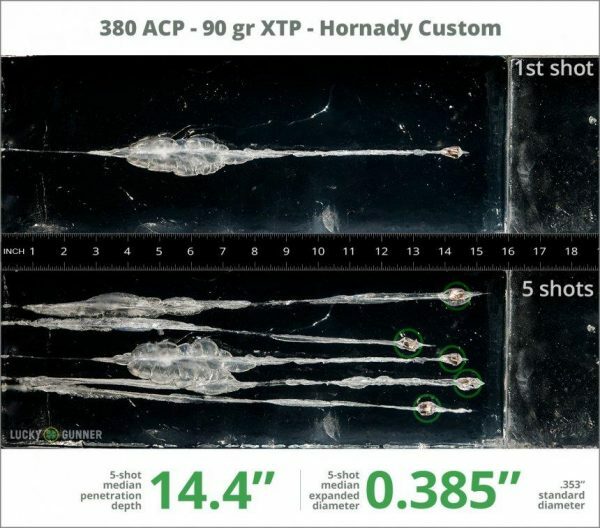 Hornady 90-grain XTP Jacked Hollow Points are a well-rounded .380 round. If the .380 Is Underpowered, Why Would I Choose It over the 9mm? Well, if power is your primary decision, you wouldn’t. But power isn’t what the .380 is made for. In some ways, the low power of the .380 ACP is actually one of its strengths, depending on how you look at it. The average .380 gun is designed as an ultra-lightweight, subcompact handgun. This makes them great for use as a primary or backup concealed carry weapon, but not so great as a service pistol for police officers and military personnel. And since the .380 cartridge doesn’t produce much recoil energy, you’re able to exercise more control over your lightweight handgun than you would with a round like the 9mm. So, what you end up getting with the .380 is a lightweight gun that’s not much different in size to pocket pistols like the .22 LR, .25 ACP, and the .32 S&W, but is far more powerful. Generally speaking, one of the biggest advantages to the 9mm is that it’s an easy-to-handle cartridge – at least when compared to the bigger calibers out there. Indeed, the 9mm does have a lot to offer in terms of power and control, making it one of the most well-rounded handgun cartridges in my opinion. However, when we’re looking at shootability between the 9mm and the .380, the 9mm loses this round. If you’re looking for a powerful caliber that’s easy to handle, the .380 delivers in every way. It may not have the same expansion or penetration as the 9mm, but it does have lower recoil. In fact, if you shoot from a 9mm handgun and a .380 handgun that weigh the same, the .380 will have 94% less recoil than the 9mm. While that low recoil will probably do you little good if you’re trying to protect yourself from someone on the other side of the parking lot, it would make a difference if you’re stopping an armed assailant who’s entering your bedroom – especially if you’re an inexperienced shooter. Which Is the Better Concealed Carry Pistol? Again, that depends a lot on the needs and expectations you have of your pistol. 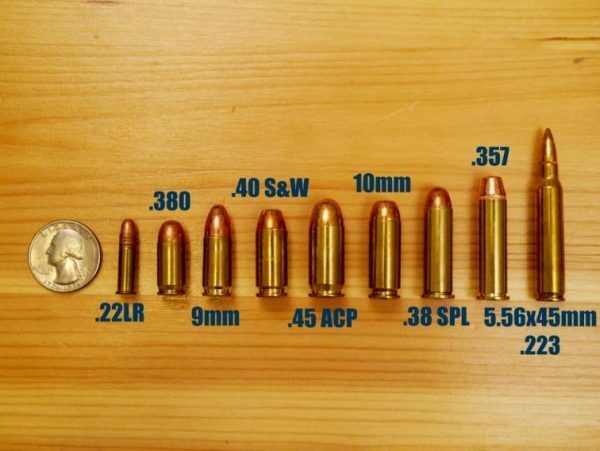 Remember, the 9mm is the superior caliber for military and police because it’s powerful, easy to control, has a maximum effective range of 50 meters (almost 55 yards). It also has a maximum range of 1,800 meters, but good luck at hitting a target that far away unless you’re shooting legend, Jerry Miculek. Needless to say, the .380 doesn’t outdo the 9mm on any of those strengths, with the exception of being easier to control. But stopping threats 50-yards away isn’t what the .380 is designed for. 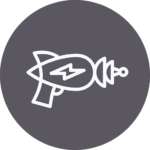 It’s a mouse gun that’s meant as a last resort to neutralize threats at close range. 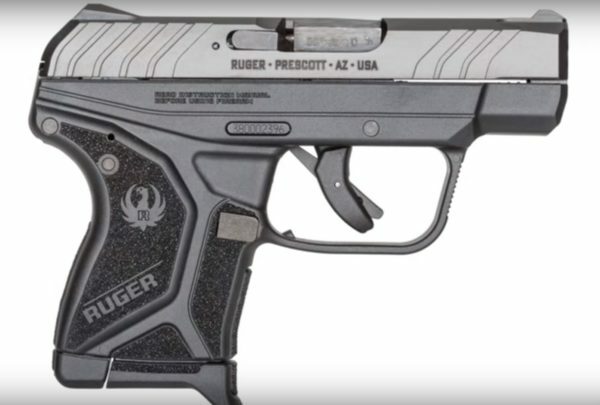 For this reason, it’s become a popular handbag pistol for female shooters and it also makes a great backup pistol for law enforcement officers. I mean, can you really go wrong with a 9mm? The type of person who thinks the 9mm is overrated is probably going to be using the .45 ACP or the .357 Mag if they like to mix it up. Personally, I believe that the 9mm is an all-around great round that’s useful in damn near every type of scenario, whereas the .380 is limited to close-range protection. Like the Ruger LCP II pictured, most .380s are extremely compact. Also, for all of you doomsday preppers looking for the best survival round, the 9mm clearly wins that one as well due to the fact that you’re more likely to come across 9mm ammo than other cartridges. If I was shopping around for my very first handgun, I’d go with the 9mm every day of the week simply because you can get more out of it. But if you’ve already got a 9mm or another big boy caliber and you’re looking for a new gun that’s lightweight and easy to carry around, the .380 makes a fine addition to your collection. Remember, the .380 isn’t an ineffective round by stretch of the imagination. It just doesn’t outperform the 9mm in any way except for weight and size. And since subcompact 9mms are a thing, there’s no reasons why you’d have to make the .380 your primary concealed carry gun unless you really wanted to. At the end of the day, part of buying a gun is finding the right fit for you. Now that you’ve learned a little bit about the 9mm and the .380, you should hit the shooting range and give both calibers a test to see which one you like best. As always, be sure to let us know what you think about the .380 vs the 9mm. Are you a big-gun slinger, a compact 9mm shooter, or do you prefer the .380 pocket pistols? If you are a fan of mouse guns and would like to add a new .380 to your collection, or your pocket, take a look at our top five concealed carry .380 pistols for more information. Also, if you’re just getting into guns and came across this page while researching for your first gun purchase, make sure to check out our in-depth write-up on home defense handguns for beginners. As you’ll see, it’s mostly a 9mm fest for the reasons I’ve mentioned above (versatility and power). Good info even though a bit redundant. 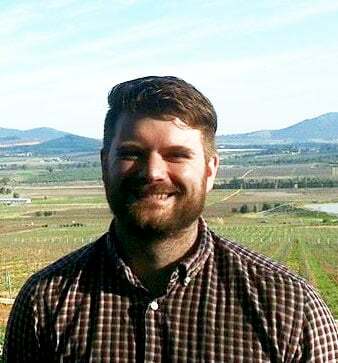 Who proofreads your articles? A Hard read. Many errors that made me stop and re-read to figure out what you meant. Check out this statistical review. According to it, the .380 is “just as good” as the 9mm by the numbers. As we all know, shot placement is king. Without seeing their data, I’m strongly mistrustful of blind statistical review. I would agree that .380 is acceptable as a defensive cartridge, but I wouldn’t put faith in that video. Thank you for posting this. I am 61 and somewhat inexperienced shooter. I am looking at buying the S&W Shield EZ, a 380, for all the reasons you mention. On YouTube Honest Outlaw just put up a review on this. Might want to check it out. As a back up or self defense firearm, most of the time if you have to use one it is going to be in close quarters, 5, 10, 15 feet the .380 is faster, lighter and easier to handle, specially if multiple shots are involved(in most situations), also it normally a cheaper firearm to buy and for someone who does not shoot a lot its a better fit and it will get the job done.